The Project “Can Do” Combine in the John Deere Pavilion. Over 300,000 cans, hundreds of volunteers, one very worthy cause. Here are a few 360 Panoramas of the John Deere Pavilion in Moline, IL with the Project “Can Do” Combine on display. 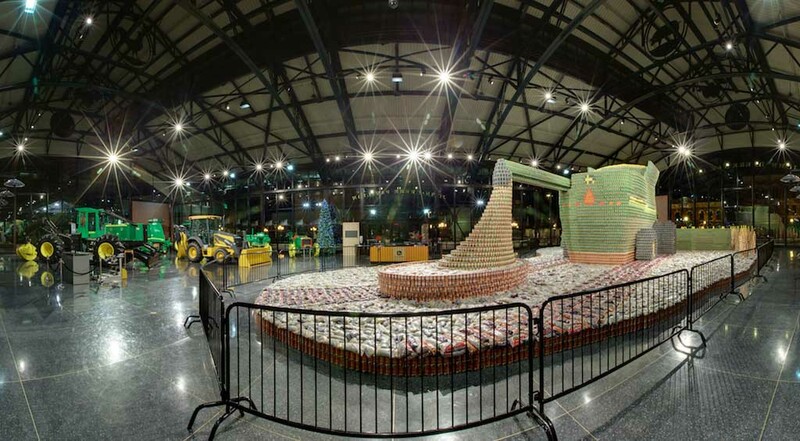 This is a life size combine sculpture that measures 80 feet long, 60 feet wide, and 16 feet tall and is constructed entirely from cans of food. On December 11th, 2011 this sculpture will be torn down and all the food will be donated to the local Food Bank ... enough food to feed 150 families for an entire year. I’ve been wanting to do some panoramas of the John Deere Pavilion and this seemed like a perfect time. Click on the poster print below to view the panorama. And ... a few stills are available here.